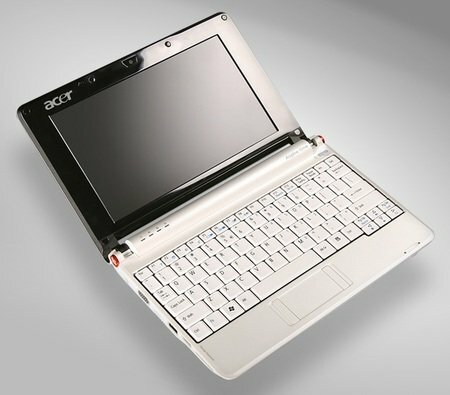 Acer has cut the price of the Aspire One, making its Small, Cheap Computer even cheaper. In the US, at any rate. Stateside, the AA1 with an 8GB SSD, 512MB of memory and Linux pre-loaded will now cost $329 (£175/€221), down from $379 (£202/€255). The AA1 with a 120GB HDD, 1GB of DDR 2 and Windows XP is now priced at $349 (£186/€235) - it used to cost $399 (£212/€269). The latter's fall makes way for new Windows XP model fitted not only with a 160GB hard drive but also a six-cell battery. The other models come with three-cell power packs. Don't get your hopes up just yet if you live in the UK, however. We contacted Acer UK, and the company confirmed the AA1 prices haven't been pruned over here. That said, that's only on the basis of "August's price-list", so we wouldn't like to say cuts won't come in September. Especially, if Dell announces its SCC in the meantime. A number of suppliers in the UK appear to be anticipating as much: DSG stores PC World and Curry have been offering the Linux AA1 for £200 of late.